When I did my research on this I realised that it actually wasn't a typo and that Cyder represented one of the 2 styles available in this alcoholic lemonade. 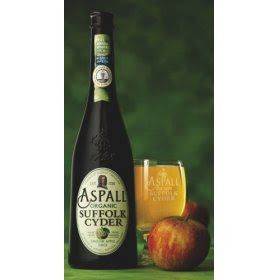 This is the French style produced in English Cider country - Suffolk. We had Sampled and attempted to sell a similar style in Ireland a few years back- 5 free tastings later with no sales and 12 out of date bottles, needless to say it wasn't a pint of Bulmers!!! I've now realised that the Irish palate was not ready for this incredibly sophisticated and elegant sparkling alcoholic pressed apple - stuff!! I don't want to call it juice because for me this conjures thoughts of tetra cartons & capri-suns and this is so much more. This style of Cyder reminds me of a good sparkling wine. Its dry on the finish with quite high acidity and a really full bodied apple and sherbet palate, it comes in 2 other styles draught and organic. All absolutely AMAZING!!! I want to see some solidarity for the good stuff - Aspalls Dry premier cru. Its really good with roast pork. I'm no expert but as you know I love my cider and if you are rating it the best you've ever tasted we're onto a winner - put some aside if you would, I dont need the summer sun to enjoy my cider all year round! Ok Lou, No worries. I'll put some away for you. Well Ruth a woman of your word as always - guys if you claim to be a cider lover, or cyder as I now know is the correct spelling since my joining this wonder blog...well this is truely the dink to be had. Forget your Bulmers and even Sweedish newbies. This bottle is all you need - once you try it you'll never look back. I am also a woman of my word, so enjoy! Loving the women of the words statement!!! Thanks Lou, hope to see you at the next tasting.